The Universe – Circa 2010, in New Orleans after a dead prez show, mikeflo (solo emcee & Official Tour DJ) finds himself simmering in what flo regards as “a good ol bangin gumbo of a beat battle”. Amongst the many talents in the room, mikeflo connects with producer/engineer Steve “504Dubb” Wade. The two eventually share files and and build landscapes. “Adjustment Bureau”, the EP was born. After touring and working on other projects over the years, the duo finally decided to share their fruits (or beignets in N.O.L.A) with the world in the form of a five song EP. The project is an obvious take on the 2011 movie namesake. In the film, the “Bureau” has the power to “Adjust” certain agendas and outcomes. With balance in Hip Hop taking on top priority of the duo’s list of needed “adjustments”, the two look to provide a powerful example of self determination personified within a rich, yet stripped down, soul-sonic rue. As flo would say, “Somebody gotta do it…” In short, they did it. The first single, “365” wove an intricate tale of the gladiator and champion in us all, and the follow up, “Pop Off” (also included in release) forewarns the weak of the explosive package the duo possesses. 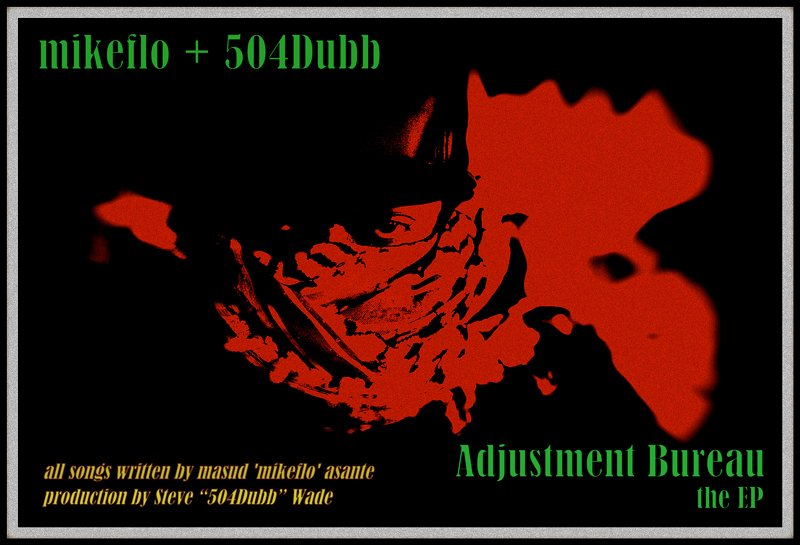 “Adjustment Bureau” the EP, features mikeflo pushing the pen and 504Dubb behind the boards. Simply put, #BANG.